In Ghana and many other parts of West Africa, every child is given a name according to the day of the week on which they are born. Here are the seven boys’ and seven girls’ names corresponding to each day of the week. Until I went to Africa, I did not know that I am a Kwabena. I had to look that up on the calendar on my phone, in a hurry, during a church service. Among the Akan people of Ghana, a child is given several names, in rare cases up to 10, but 4 is not unusual. One of those names is the day of the week on which they were born. Some people might not know their birth date, and in times past they might not even be sure of the year, but everyone knows the day of the week on which they were born. We have a friend in Nigeria whose name is Friday, in his language. One of my favorite Ghanaian Christian authors shares my day name – Kwabena Asamoah-Gyadu. Churches use these groupings in various ways including raising funds for projects. I took this photo of a banner at a church in the city of Ho. 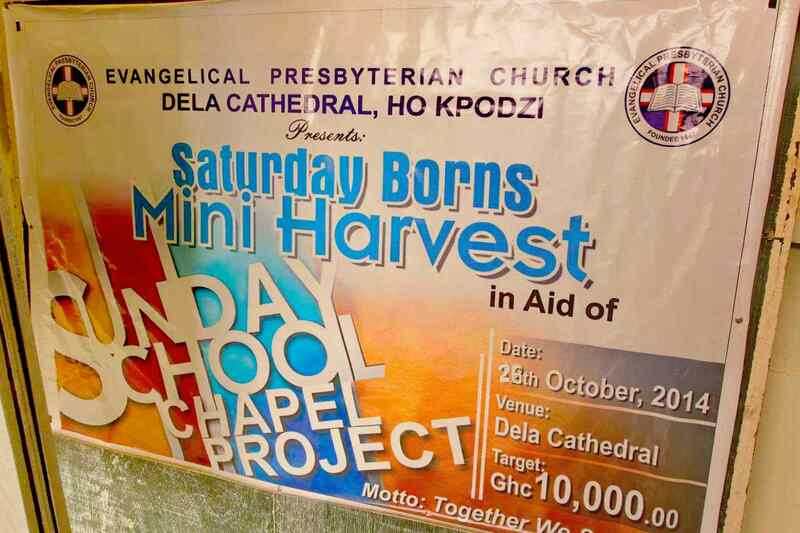 It is announcing that all those born on Saturday (Saturday borns) in the church have undertaken a project to raise funds for a chapel for the church’s Sunday School. I have been in church services where the congregation was asked to sit in “day born” groups. So I went and sat with everyone else who had been born on a Tuesday. Special offerings can be the occasion for competition between “day borns”. It happened to me just a few weeks ago. 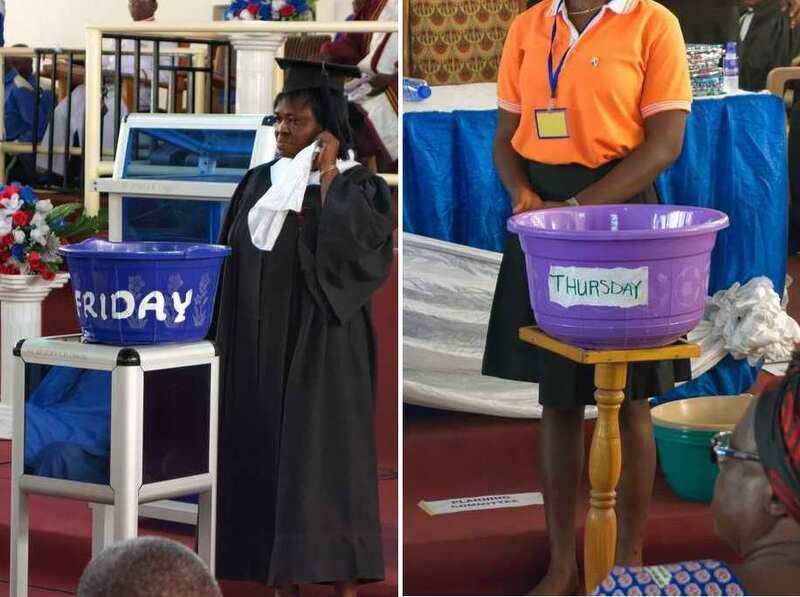 The ushers set up offering baskets at the front of the church, each labeled with a day of the week. Everyone danced to the front in vibrant worship and put their offering in the basked corresponding to the day of the week on which they were born. The ushers then busied themselves counting the amount in each basket. Later in the service, the results were announced. The Wednesday-borns, the Kwakus and Akuas, had given the most followed by the Friday-borns, then Saturday, Tuesday, Thursday, and Sunday. The Monday-borns gave the least – about 1/5th of that the Wednesday-borns gave. This entry was posted in Culture, Ghana, Personal experience and tagged Akan names, day born, day name. Bookmark the permalink. What an interesting read about the culture there, Ed. Can you imagine how that might work here in the states – let’s say for bill paying, or how about entry into sporting events? What a concept! Fortunately, Ghanaians tend to give lots of other names, so the confusion is kept to a minimum. Will that conversion calendar for day of birth convert the fact that I was born on August 22, 1953 in the Philippines but I was on the left side of the International Date Line, which means that I was also born on August 21, 1953 in Canada. It was quite fun—my Dad sent a telegram that the family received at 9:00 a.m. on August 22, stating that I had been born at 4 p.m. on August 22. So… which day WAS I born??? That’s a bit of a conundrum! Beth, has an interesting twist to it. I know the Luo’s in Kenya have some of this tradition. They also know what time of day it was, such as evening, morning, when the cows come home, etc. So I can add “Yaa” to my name. How is that pronounced?